This was no ordinary event, but one that will have an impact, first and foremost, on the fate of the International Monetary Fund. The money in question is part of an IMF agreement to provide Ukraine with $17.5 billion in loan funds, under a four-year program to prop up the Ukrainian economy that was created with the IMF’s active input. The foreign funding for that program, including the loan from the IMF, totals $40 billion. Under this program Kiev received its first installment of $5 billion, followed by the second ($1.7 billion), and was awaiting new disbursements. However, the third payout, expected by late 2015, never arrived. The process ground to a halt. The official explanation centered around the claim that Ukraine was unable to meet its commitments. This was especially true when it came to various promised reforms within the systems for taxation, social security, fees for services provided by commercial-sector businesses, and so on. The IMF also cited the lack of progress in privatization, fighting corruption, etc. This list of grievances has been updated and modified almost every month. For the record: Ukraine has to date managed to pull in a total of approximately $20 billion from the IMF (since 1994). A glance at the documentation from those years shows that Ukraine has never met its obligations in full, but the IMF money just keeps pouring in. So something else must be going on. When Ukraine became a global hot topic in early 2014, the US started using Kiev to put pressure on Russia — and radical changes began to take place in the life of the IMF. Uncle Sam is the fund’s biggest «shareholder» (it controls a blocking share in the capital and voting power of this international financial institution), and with utter shamelessness it began to employ the IMF as a tool to further its own Ukrainian policy. The IMF’s decision to issue the most recent loan early last year was made under unprecedented pressure from its biggest «shareholder.» But that decision was against the law, and all the members of the fund’s Executive Board, including Managing Director Christine Lagarde, knew it. First of all, the IMF’s previous offer to extend credit to Ukraine in 2014 was no longer in force. The reasons were very simple — the borrower was not creditworthy. One would think that that would have closed the chapter on the IMF’s relationship with its client. That had been the IMF’s response to many countries for decades. But something unprecedented happened: this insolvent client was offered a new loan agreement in the spring of 2015, on much more favorable terms than the previous one. The second problem, which is even more significant, is the fact that the fund is not allowed to issue loans for political reasons. The rules for this organization are clearly written in black and white: loans are not given to countries where wars are being fought. One would have to be blind to deny that a bloody war was raging in Ukraine in the spring of 2014. However, Ms. Lagarde and other IMF officials were ordered by the fund’s biggest «shareholder» to proceed blindly. And this was the environment in which they made their decision about a loan agreement for Ukraine. The IMF has always been a politicized institution and an important tool of US foreign policy. However, both Washington and the fund have observed the minimum standards of propriety, acting within the rules that have been formally approved by all members of that organization. Sometimes they did try to change those rules to better fit their needs, but they did so within the framework of the existing procedures. Today, any sense of propriety has been tossed aside. A loan agreement signed in December 2013 between Russia and Ukraine expired late last year. That loan was for $3 billion. Under the terms of that loan, Russia used assets from its own National Wealth Fund to purchase Eurobonds issued by the Ukrainian state treasury. Long before its maturity date, the Ukrainian government — goaded by Washington — began claiming that it would not repay the loan and demanding that Moscow restructure that debt the same way Kiev had managed to restructure other foreign Eurobond debt during the summer of 2015. But that restructuring involved debt from securities that had been purchased by private investors. Russia is in a different category. Kiev’s $3 billion debt to Moscow is a classic example of sovereign debt. Kiev was loath to admit this, trying to equate that debt with debt owed to the private holders of Eurobonds. 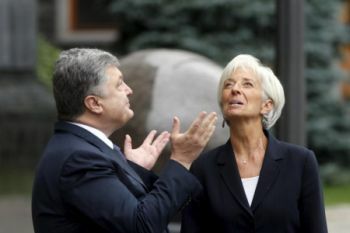 The IMF pretended that the dispute between Moscow and Kiev was none of its concern. But at the same time, Christine Lagarde and other fund officials were well aware that this debt problem could have a serious impact on the future of that international financial institution. After all, a flat-out refusal by Kiev to repay its debt to Moscow would signify a full-blown default on the part of Ukraine. At that point the entire program to resurrect the Ukrainian economy, along with the most recent loan agreement, would go off the rails. And that would be unacceptable, since the biggest «shareholder» is insistent that the IMF support the regime in Kiev unconditionally. But last year the fund was still forced to admit that 2 x 2 = 4 — meaning that what Ukraine owes Russia is sovereign debt. Under pressure from Washington, the IMF simultaneously took an additional step. It made revolutionary changes to its rules of lending, «just for Ukraine.» The new rules ensure that it is still possible to keep extending credit to a country, even if it completely defaults on sovereign debt. However, a proviso was included that lending could continue only if the debtor nation demonstrated a «good faith effort» to reach an agreement with its creditor country. And Kiev began behaving with unprecedented audacity once it felt itself to be safely under Uncle Sam’s wing, and started claiming that it would never repay any of its debt to Russia. There was no attempt to even manufacture the appearance that that debtor nation was trying in «good faith» to resolve its debt problems with its creditor country. Moscow took the issue of Ukraine’s debt to an international court, but it looks like that court is going to take its own sweet time to rule on the matter. It would be no exaggeration to say that there was a revolution in global finance in late 2015. Over time, it will send a powerful wave of chaos throughout the global financial system. This system has been deprived of its most rudimentary rules and guidelines that had previously safeguarded global markets by preventing financial entropy. Life hasn’t been easy in the last year for Christine Lagarde, the fund’s managing director. She is well aware that the nihilism currently thriving at the IMF could end badly for that institution. She resisted the pressure from her biggest «shareholder» as best she could, but then Uncle Sam resorted to a tried-and-true way of putting pressure on public officials. Last year a French court unexpectedly began investigating Ms. Lagarde for possible abuses of power while she was the French minister of finance. However the dust soon settled on this legal episode, which signaled the managing director of the IMF to fall in with the «arguments» offered by the biggest «shareholder». For a few months Lagarde dragged her feet as best she could, trying to avoid the nightmare that erupted nonetheless on Sept. 14 at the IMF board meeting. The reason the decision about providing Ukraine with its next loan installment was being continually rescheduled was not because Kiev «wasn’t fulfilling» some condition — that country is still in no position to fulfill anything. It was a just a bit of theater choreographed by Madame Lagarde. But finally the theatrical director — Uncle Sam — intervened and told the bureaucrat to stop messing around. Uncle Sam could not care less about Ukraine’s «economic recovery», but the US needs that country (under its current regime) as a tool to keep putting pressure on Russia. Not only political and military duress, but also financial. The IMF is essential for those ends. Washington’s recent reckless behavior toward the IMF is reminiscent of Herostratus - the legendary arsonist of ancient Greece — setting fire to the Temple of Artemis. For seven decades the fund has been a useful US foreign-policy tool, but now those halcyon days are coming to an end for Washington. The vast majority of the IMF’s members are fed up with America’s stranglehold. And eventually that discontent led to the beginning of the process to reform the fund, especially in regard to a review of the quotas of capital and voting shares assigned to its member countries. In the near future this could result in the United States losing its controlling stake in the IMF’s capital and voting power. That’s not the kind of IMF Uncle Sam needs. Russia did not take the biggest hit at the Sept. 14 voting session for the IMF’s board. The primary blow was inflicted upon the fund itself. As well as upon the global financial system that has evolved during the seven decades since WWII.